Photo measuring 2.5 x 3.5 inches. There are remnants of black paper glued to the back from having been mounted in a photo album. 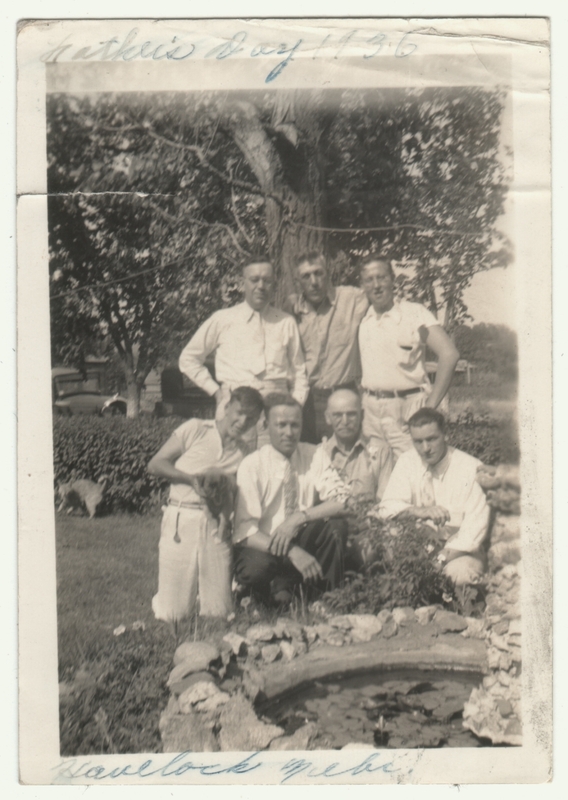 Written on the back is: Father’s Day / June 1936 / Havelock / Nebraska. Much of the same information is written on the front. Okay, this isn’t the greatest photo, but it’s the only one I could find specifically marked Father’s Day (which, to my non-U.S. readers, is today). I find these people interesting to look at anyway, and I’m stumped trying to guess what the relationships are. The implication is that they are all related, and that this represents some combination of father and son, brothers, uncles, maybe cousins, etc., but I can’t quite sort it out just by looking at them. By the way, my cat fanatic readers should note, there are two (count ’em, two!) cats in this picture: the boy in the lower left is holding one, and there is one along the hedge in the back.